What is ZTE, and why does the US think it's a national security threat? What is ZTE, and why do American officials believe it poses a national security threat? ZTE is a Chinese telecommunications equipment manufacturer that was founded in 1985. Among other products, it makes inexpensive Android smartphones. ZTE says it has partnerships with 150 wireless companies in more than 60 countries. It is the fourth-largest seller of mobile phones in the United States and the second-largest seller of prepaid phones. The company uses parts from many US companies, including chips from Qualcomm (QCOM) and glass from Corning (GLW). Its US headquarters is in Richardson, Texas, and it has about 75,000 employees around the world. The company is listed on both the Hong Kong and Shenzhen stock exchanges. 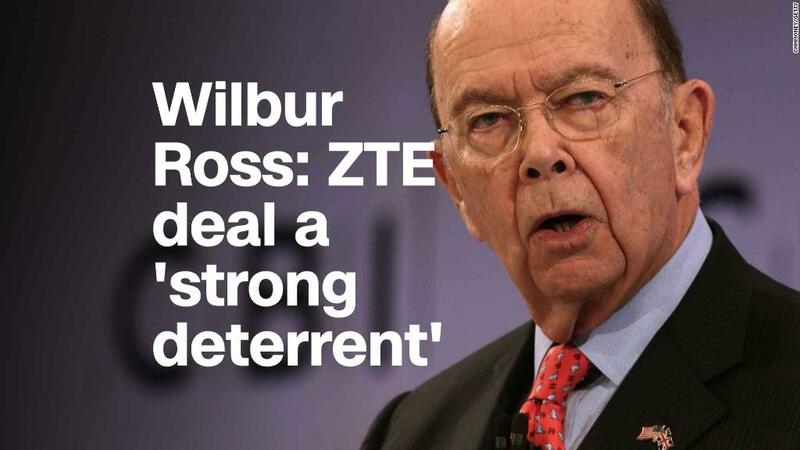 Why does the US government say ZTE poses a national security threat? In March 2017, ZTE agreed to pay a record fine of $1.2 billion to the United States for violating sanctions on Iran and North Korea. The company was accused of shipping equipment to these two countries. It had allegedly made 283 shipments to North Korea. ZTE claimed to have stopped doing business in Iran in 2012 but secretly resumed operations there the next year. "Those who flout our economic sanctions and export control laws will not go unpunished — they will suffer the harshest of consequences," Commerce Secretary Wilbur Ross said in a statement after the fine was announced. After that, ZTE overhauled most of its top management. CEO Zhao Xianming, who had taken over in April 2016, said the company had introduced new compliance procedures. "ZTE acknowledges the mistakes it made, takes responsibility for them, and remains committed to positive change in the company," he said at the time. Why did the United States impose a ban on ZTE? But ZTE didn't punish the employees who were involved. Instead, it paid them full bonuses, the Commerce Department says. That's why, in April 2018, the United States imposed a seven-year export ban on the company. American companies were forbidden from selling parts or services to ZTE. The company still relies on US tech for its products. The ban brought its factories to a standstill. And shareholders were left in limbo. ZTE's Hong Kong-listed stock has been suspended since the ban took effect. Why did the Trump administration offer ZTE a lifeline? The US crackdown on ZTE came at a delicate time for economic relations between Washington and Beijing. The two sides had threatened each other with waves of new tariffs on tens of billions of dollars of exports. The Trump administration came up with a tentative deal in May to get ZTE back into business by lifting the ban and imposing other punishments instead. "The objective was not to put ZTE out of business," Treasury Secretary Steven Mnuchin said. "The objective was to make sure that they abide by our sanctions programs." Trump also tweeted his support to find "additional remedies" to the issue. But Trump's lifeline was controversial. The Senate Banking Committee overwhelmingly approved an amendment that would block Trump from reducing penalties on ZTE without first providing Congress proof that the company is following American laws. "If the president and his team won't follow through on tough sanctions against ZTE, it's up to Congress to ensure that happens," Senate Minority Leader Chuck Schumer said last month. "Both parties have come together today to strongly rebuke ZTE and the administration's soft approach." Ross announced the new deal on Thursday. Under the deal, ZTE will pay the United States a $1 billion fine and put $400 million in an escrow account in case it violates the terms. It must change its board of directors and executive team in the next 30 days. And an American oversight team will be installed inside the company. "This is a pretty strict settlement," Ross told CNBC. "The strictest and largest settlement fine that has ever been brought by the Commerce Department against any violator of export controls." "This should serve as a very good deterrent not only for them but for other potential bad actors," he said.